As a recent SkS post by Dana Nuccitelli has pointed out global warming hasn’t stopped, despite a recent lull in global surface temperatures. The oceans, which are the main heat sink for global warming, have scarcely skipped a beat in soaking up heat. The hiatus in global surface temperatures appears to simply be a reflection of natural variability, principally the exchange of heat between the ocean surface and the atmosphere. But we shouldn’t expect this to last much longer. Eventually that ocean heat buried in deeper layers will come back to the surface, and we’ll experience the warm phase of this natural cool/warm (La Niña/El Niño-based) cycle. As if to reinforce this very point, a group of scientists at the NASA Goddard Institute for Space Studies (NASA GISS), have released an analysis of global temperatures in 2011, and near-future prospects. They find that 2011 was the 9th-hottest year on record (9 out of the 10 hottest years on record since 1880, have occurred in the 21st century), and that this cool-ish year (by 21st century standards, but hot by 20th century standards) was largely due to the cooling influence of a quiet phase of the 11 year-long solar cycle (small changes in the intensity of sunlight reaching Earth), and La Niña which has been dominant over the last 3 years (See figure 1). They conclude that the lull is an illusion, and that rapid warming of global surface temperatures is likely to resume in the next few years. 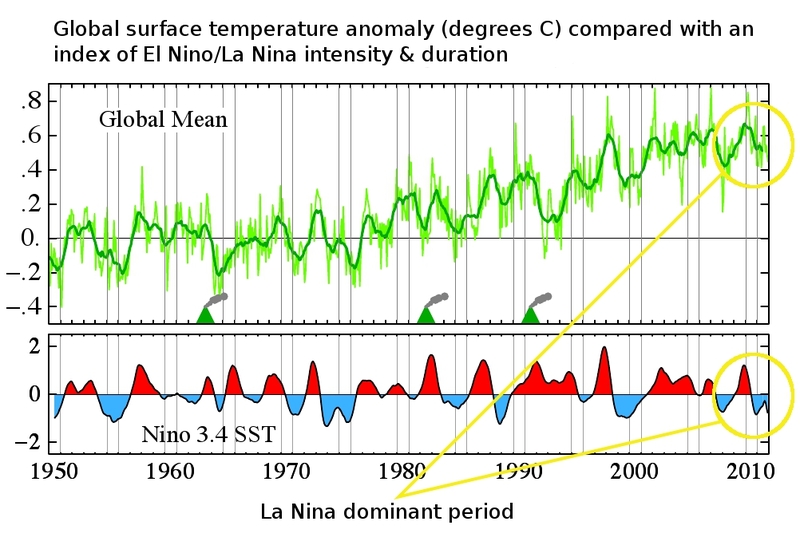 Figure 1 – Global monthly and 12-month running mean (average) surface temperature anomalies relative to the 1951-1980 base period (GISTEMP), and the 12-month running mean of the Nino 3.4 index of sea surface temperatures (an index of La Niña/El Niño intensity and duration). Image adapted from NASA GISS. Covering around 70% of the Earth’s surface, and having a heat capacity a thousand times that of the atmosphere, the oceans are the main reservoir of heat on the planet; indeed, over 90% of global warming actually goes into the oceans. Carbon dioxide has a bit of a double-whammy effect on global temperature because not only does it trap more heat in the atmosphere, but it also traps more heat in the ocean. Because of this, and although not the only influence on climate, carbon dioxide is the Earth’s main climate control knob. Greenhouse gases such as carbon dioxide dictate the amount of heat retained by the ocean over long intervals because of the manner in which they alter the temperature gradient in the ‘cool skin’ layer which is the oceans interface with the atmosphere. Increase greenhouse gases, and in the absence of counter-acting forces, ocean and global temperature rises too. This greenhouse gas control of ocean heating is why global temperatures exhibit a tightly coupled relationship with carbon dioxide over time. And is why carbon dioxide concentrations closely matches global temperature as revealed in the ice core records (Figure 2). Figure 2 – Vostok ice core records for carbon dioxide concentration (Petit 2000) and temperature change (Barnola 2003). The oceans affect global temperature through the heat that they exchange with the atmosphere, but this exchange is not a steady, or monotonic process. There are large annual and multi-year up-and-down fluctuations due primarily to the vast amount of heat which sloshes around in the equally vast Pacific Ocean. This phenomenon is the El Niño Southern Oscillation (ENSO), which is essentially the re-distribution of heat already within the climate system. The large surface temperature fluctuations are due to the tilting of the thermocline, a term describing the wind-driven pooling of heat in surface and deeper layers of the western Pacific Ocean (near Papua New Guinea and the Philippines) during La Niña, and the leveling that takes place as the warm water wells back up, and spreads out over the central and eastern Pacific Ocean surface during El Niño. See this great animation to gain a clearer understanding of the process. The upshot of these fluctuations is that the cool water which upwells to the surface along the Pacific coast of America, during La Niña, and the burial of warm water into deeper layers in the western Pacific, serve to cool global surface temperatures because of the surface heat exchange of cooler water with the atmosphere. 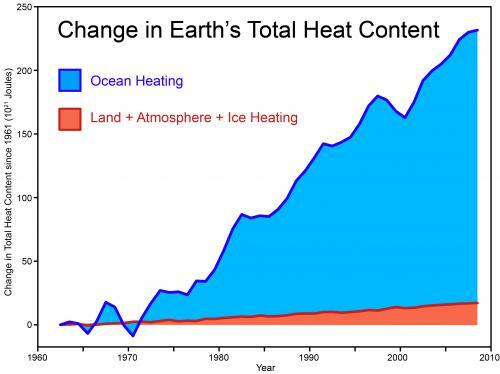 It might seem counter-intuitive, but in spite of this the oceans are actually gaining substantial amounts of heat. It is the opposing warm phase, El Niño, when warm water rises up to the surface and warms the atmosphere that heat is lost from the ocean and it undergoes temporary cooling. SeeRoemmich & Gilson (2011). A demonstration of the global scale of this overall heat burial/heat surfacing mechanism is apparent in figure 1, once major volcanic eruptions are accounted for. However figure 3, based upon data from the ARGO float network, provides a clear illustration of the heat being sequestered in the subsurface layers of the ocean during La Niña. Figure 3 – (a) Time‐series of globally‐averaged (60°South to 60°North) temperature anomaly from the monthly mean, versus pressure (dbar). The contour interval is 0.02°C and values are smoothed by 3‐month running mean. (b) Time‐series of globally‐averaged sea surface temperature (black, °C), T160 – heat down to 160 metres (blue), and the Nino 3.4 index estimate for SST (red). Adapted from Roemmich & Gilson (2011). Because these annual and multi-year up-and-down temperature fluctuations can be as much as ten times as large (+/- 0.2°C) as the signal from the small (by comparison) annual increase in global warming, a period dominated by La Niña can temporarily obscure the warming trend in the global surface temperature record (see figure 1). This happens even though the oceans are steadily accumulating heat. See figure 4. Figure 4 – Revised estimate of global ocean heat content (10-1500 metres deep) for 2005-2010 derived from Argo measurements. The 6-yr trend accounts for 0.55±0.10Wm−2. Error bars and trend uncertainties exclude errors induced by remaining systematic errors in the global observing system. See Von Schuckmann & Le Traon (2011). With some background of the ‘bigger picture’ having now been spelled out, the analysis by NASA scientists James Hansen, Reto Ruedy, Makiko Sato and Kwok-Wai Ken Lo should, hopefully, be that much clearer. As stated earlier, their analysis found 2011 as the 9th-hottest year in the NASA GISTEMP temperature record. All the ten warmest years have taken place in the 21st century, with the exception of 1998 – which was warmed by the largest El Niño of the 20th century. By plotting the GISTEMP temperature series against a 12-month, 60-month (5 year) and 132-month (11 year) running means ( 12, 60 & 132-month averages) the authors show that the global warming signal becomes increasingly more apparent. The 60-month running mean removes much of the noisy influence of the multi-year El Niño/La Niña cycle, and the 132-month running mean removes both the El Niño/La Niña cycle, and the 11-year solar cycle (figure 5). Figure 5 – Global surface air temperature anomalies relative to a 1951-1980 base period for a) the 12-month running mean, and b) the 60-month and 132-month running means. This is exactly the point made in the SkS post: Going down the up escalator – the illusion of no long-term warming is only accomplished by narrowly focusing on short term periods, and totally ignoring the long-term warming trend (figure 6). Figure 6 – BEST land-only surface temperature data (green) with linear trends applied to the timeframes 1973 to 1980, 1980 to 1988, 1988 to 1995, 1995 to 2001, 1998 to 2005, 2002 to 2010 (blue), and 1973 to 2010 (red). Although the NASA scientists merely point this out for illustrative purposes, a more rigorous approach to remove the short-term natural fluctuations in order to reveal the underlying global warming trend was made by Foster & Rahmstorf (2011). They found that global warming continues its upward climb (figure 7). Figure 7 – Annual averages of the adjusted global surface temperature data, – i.e. the global warming signal with short-term natural variability removed. Next in Part 2: seasonal anomalies, the Arctic Oscillation, the solar cycle and other climate forcings.